This entry was posted in Campus Announcement, Faculty and tagged women studies on July 22, 2011 by Wire Eagle. AUBURN – Joyce deVries, an associate professor in Auburn University’s Department of Art, will be director of the Women’s Studies Program beginning fall semester. 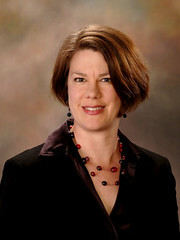 DeVries will follow director Ruth Crocker, a professor in the Department of History, who has led the program since 2005. Women’s Studies is an interdisciplinary academic program in Auburn’s College of Liberal Arts, with a mission that includes promoting research and scholarship about women and gender across disciplines. DeVries’ area of expertise is the visual and material culture of early modern Italy with an emphasis on the material culture in the domestic sphere and the visual construction of gender. Among the courses she has taught at Auburn are Introduction to Women’s Studies and a course on gender issues in the visual arts. Her book, “Caterina Sforza and the Art of Appearances: Gender, Art, and the Culture in Early Modern Italy,” explores a ruling noblewoman’s patronage and collecting practices and the ways she harnessed culture to stretch accepted gender roles. She has presented papers related to this project at national and international conferences and has published several articles on the topic. Her work on Sforza was supported by a National Endowment for the Humanities Summer Stipend and a Millard Meiss Publication Grant from the College Art Association. Women’s studies classes were first offered at Auburn in the 1980s, with the women’s studies minor approved in the mid-1980s and the program growing to maturity throughout the 1990s. With more than 40 affiliated faculty and a wide range of course offerings in 20 disciplinary areas, Auburn’s Women’s Studies Program offers an undergraduate and graduate minor in Women’s Studies. Courses in Women’s Studies can be taken as electives by undergraduates in any major. Approximately 1,600 undergraduates take one or more women’s studies classes each year.